Building Your Work Optional Life - Can I Retire Yet? Tanja Hester and her husband, Mark Bunge, retired in December 2017 at the ripe old ages of 38 and 41. 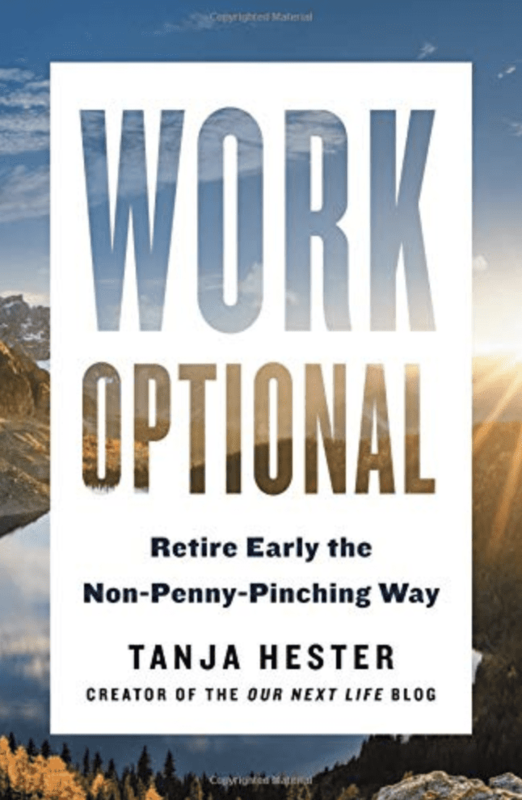 Hester, author of the award winning blog Our Next Life, is releasing a new book, “Work Optional: Retire Early the Non-Penny-Pinching Way,” to help others create their own early retirements. As a long time reader of Our Next Life, I was excited to read the book. Hester provides unique insights, in depth analysis and takes strong stances on controversial topics. All of this stands out and creates an environment embracing diverse viewpoints among FIRE blogs that can serve as echo chambers. Tanja and Mark also have a personal story that resonates with me, as it likely will with many of you. They rejected high earning, but high stress, careers to move to the mountains of Lake Tahoe to pursue a simpler life. Read on for my full review of “Work Optional: Retire Early the Non-Penny Pinching Way.” I’ll share where this book shines and can add value to planning your early retirement, as well as where it falls short, to help you decide if you want to build a work optional life of your own. Hester demonstrates her writing chops from the first paragraph of the introduction, drawing readers in with her personal story. She describes a typical Friday night during their working years that was all too familiar; exhausted, falling asleep on the couches unable to make it through a TV show, one eventually waking the other to trudge off to bed. In Chapter 1, Hester emphasizes recognizing the “freedom to define retirement for yourself.” She provides three categories of retirement – full early retirement, semiretirement and career intermissions – advising readers to choose the path that matches their abilities, needs and desires. This is consistent with what I call redefining retirement. It demonstrates growth and learning. Hester accepted society’s definition of what she should pursue by chasing career prestige only to be let down. So she rejects the idea that you have to accept one definition of retirement. Instead she advocates choosing the life you want to live and planning finances around that. The entire first section of the book, “The Work Optional Life You Want to Live,” was extremely effective. Hester makes it clear she is not naturally frugal, and that she had a hard time saving early in her career despite earning a high income. I tend to write frequently about investing and tax planning, but not because I am a rare expert in these areas. To the contrary, I can effectively communicate erroneous thought patterns because I had them and quickly spot common mistakes because I made them. Similarly, Hester turns her past weaknesses and failures into an area where she can assist others with common struggles. She clearly worked hard to develop a framework and system that allowed her to save far more than previously imaginable. The exercises in the book will help others with similar struggles. Throughout Work Optional, Hester presents an interesting dichotomy. She and her husband retired decades earlier than most and are avid adventure seekers. At first glance, they may seem like daring risk takers. Simultaneously, she emphasizes risk management at every step and and is serious about planning. The book is extremely detailed, thoroughly researched and well reasoned. Chapter 9 – Make Your Plan Bulletproof, was particularly interesting to me as someone who tends to at times let worry and fear take over. The chapter hits big risk management issues such as diversifying income sources, protecting against inflation risk and creating a withdrawal strategy. Where the book, and this chapter in particular, shines is the attention to detail and willingness to talk about topics most people tend to avoid. A reasoned discussion of whether your retirement plan could sustain a divorce is an example of the latter, while unique insights about long term care insurance is an example of the former. Another strength of the book was an emphasis on holistic planning. Retirement planning is often viewed as a financial exercise. Personal wants and feelings tend to get pushed to the side or even presented as a weakness if they go against mathematical probabilities or cause you to save less. Hester demonstrates that she knows her math and understands technical details of planning. However, she always emphasizes lining up your strategies with what feels right for your situation. She also emphasizes the importance of considering your partner’s feelings and desires in the retirement planning process and making sure all parties are on board with a plan. These themes are present throughout the book. Hester struck the right balance, making the book accessible to those who aren’t naturally driven by numbers and spreadsheets, while maintaining technical accuracy and not dumbing the book down. My biggest criticism is of Chapter 4 – Invest to Fund Your Future. The chapter starts strong, emphasizing the importance of simplicity and understanding your investment strategy. The chapter covers the four investment approaches likely to lead to success – total return, dividend focused, rental real estate and passive business income. All of this is spot on and easy to digest. However, Hester then spent nearly 20 pages dissecting “investment vehicles to consider.” This section jumps back and forth between asset classes (stocks, bonds, real estate), vehicles to hold those assets (including mutual funds, ETFs, REITs, etc.) to detailed explanations of all the tax advantaged account types (including 401(k), Roth IRA, spousal IRA, 529 College Saving Funds, etc.). For good measure, this section also touched on robo advisors, pensions and social security. She continues with another six pages discussing savings vehicles to supplement investments and investment vehicles to avoid. Trying to read the book through the eyes of a beginner, it was simply too much information to be able to process and take action. As a seasoned DIY investor, it was equally ineffective. While other themes present through the book were very effective, this idea of trying to be all things for all readers is my other critique. “Work Optional” is written to take a reader from beginning, learning to earn and save more and start investing, to end of their financial independence journey, transitioning to retirement and living a fulfilling work optional life. I appreciate the value of planning holistically from the beginning with the end in sight. However, trying to cover the whole process with this level of detail at every step at times made it difficult for me to maintain my interest. The information, while technically accurate, may have been more effectively presented as two or even three more focused books. “Work Optional” is an excellent resource for anyone who wants to escape the grind of a traditional career path. It will help break through limiting beliefs of what career and retirement should look like. The book is especially applicable to professionals who have difficulty saving despite a high income or for those who feel trapped by career “success.” I wish I could have read this book ten years ago. It would have saved many mistakes I made getting started on the path to my work optional life and provided a reference to return to throughout my journey. For those already saving and planning for early retirement, this book will challenge your assumptions. The detailed planning exercises and unique insights may allow you to retire sooner and/or more securely. It will also help you thrive in the work optional stage of your life. Focusing more on the “softer side” of retirement planning such as considering the emotional aspects of the transition from career to retirement and communicating better with my wife could have prevented a lot of the struggles we faced over the past year. Ultimately, a book that tries to be all things to all people is destined to fall short at times. But “Work Optional: Retire Early the Non-Penny-Pinching Way” is packed with valuable insights and information that will add value for readers at various stages of the journey to financial independence. Update 2/12/19 — The winners of the books are Sonja J and Derrick. Congrats! I’ve followed her posts for a while. I especially appreciated her thoughts on the importance of medical insurance, even while young. I hope I win a copy! Agree that her posts on medical insurance are very detailed and nuanced. I find that I learn something new every time she writes about the topic, even though we tend to come to different conclusions. Great review Chris! I’ll definitely be adding this book to my “must-read” list. We also struggle to be naturally frugal so it is always wonderful to read about experiences of similar like minded individuals. My wife and I are on the hunt for early retirement and can feel ourselves inching closer each year. Sites like this one really help us see the benefits that can lay at the end of the journey! I would enjoy a copy of this book. Retired early last year and volunteer and read so much now I don’t know how I had time to work before! Would love a free book copy and thanks for the honest review. I enjoyed your review of the book, including the positive and negative points. I do agree that too much detail can sometimes lose a reader, especially beginners. However, I do like the areas covered and feel it could be important in helping someone assess their retirement plans and readiness. Overall a great book. It can be difficult to review books for people like Tanja and Todd T as I did last month, b/c I have learned a lot from each, respect their work greatly and consider each friends. Ultimately I find it’s important to write an honest review though, otherwise it doesn’t help readers of this blog, nor does it help the authors if people buy books they ultimately don’t like. I would love a copy of the book! I want to make “work optional” in my life too! Thanks for the great book review! I enjoy your work and would like to be in the drawing for the book! I’d like to share it with my son, I’m already retired and doing well. Thank you for reviewing this book. I enjoyed reading about the PROS and the CONS of this book in your opinion. I heard Tanja on a podcast this morning and it sounds like a very interesting book. Thank you for the honest assessment of Chapter 4; I will skip it and avoid the pain! I look forward to reading the other Chapters. Based on your review, I would really like to read this. A lot of the material I’ve read about FIRE is primarily focused on money, which is fine, but there is more to retirement than money! Agree 150% Kate. Really appreciate the honesty in Tanja’s writing and find that it challenges me to think at a deeper level. I’ve followed your posts for a while and would love to win a copy of this book! Thanks for the review. I have not followed her blogs, but am intrigued by your review. I hope I win a copy! My whole financial strategy for retirement is save, save, save. I hope I win a copy of the book! Great post Chris! Even though I’m not a person who comments on what you write I enjoy reading your articles. I really enjoy getting your enewsletter and even though we are six years out from retirement it has helped tremendously! I would love a copy of Hester’s book! Thanks for the review. I’ve never heard of her blog so I’m interested in reading more about their views. At first glance (this review) it sounds like a blueprint for my family. Also, I like free stuff! I have been following and enjoying you and Tanja for a while. I appreciate that she does acknowledge that her household has a high income and that we been fortunate to have had an incredible bull market in stocks, bonds and real estate which make the concept of early retirement a discussion. I’m not sure future generations will have an easy path. I would love a copy! I first read Ms Hester’s writings on Marketwatch. I did not know that she and I are neighbors – I spend my summers in the mountains around Tahoe. Mayhaps I’ll see her on the trail some day. That would be cool. Actually met a CIRY? reader on a ski gondola last week. Made my day! Just recently retired in good ole Cali and need every penny to work. I could use this book. I’m always game for a free book. Agree JW and thanks for the kind words! Very good review of this book which I would love to add to my growing library of educational material on retiring early …. Pick me to receive a copy and I’ll pass on every tidbit of valuable information to our other disciples ! A very balanced review that makes me want to read the book. Thanks for entering me in the drawing. 2019 is the year I promised myself to solidify my retirement goals. I have learned so much from reading this blog already. Of course there is so much more to learn. Sounds like this book would be an outstanding resource. I’ve read her posts for a while, and have found it inspiring that they were able to retire early in a high cost of living state like California in contrast to many others who share stories of retiring early in low cost of living areas and geographical triage. I’d love to win a copy. The title of the book seems contradictory and implies a slower rate of saving. As many of us can attest, having a high income leads inadvertently to high spending. Keeping the spending side of the equation in check is a major challenge that increases as we transition from full time work. I’d love to win a copy and read the book and see if she addresses this important concept. Better yet would be strategies and ways to break the old spending patterns! We’re already tracking and categorizing all spending through the wonderful Mint.com so we have that base covered. To be clear, Tanja advocates increasing your savings rate. It really is in the messaging. Last month, I reviewed Todd Tresidder’s new book ( https://www.caniretireyet.com/leverage-create-retirement-income/) and my major critique was his use of the terminology “extreme frugality” to describe what people like Tanja and myself do. I personally feel very uncomfortable saying my lifestyle is extreme frugality when I’ve done things like travel the world and attend Super Bowls (yes plural) while saving for retirement. She explains the same, noting that she lives in Tahoe and once spent $1,000 on a single dinner (though obviously not habitually). It’s really all semantics. Hope that clarifies. I recently “retired” from a very stressful job with an extremely abusive client. This decision to leave my career was earlier than I had hoped and envisioned, but I concluded it was best for my family and me. I am now in the exploration phase as to how to best enjoy the next chapter. Reading your blogs has already been very helpful and informative. I think I would enjoy and benefit from the book. Thank you for your insights. I am a long time reader of Can I Retire Yet and your previous blog. I’m always learning something thought provoking. Thank you to you and Darrow. Please enter me to win a copy of “Work Optional “. I’ve just discovered the FIRE movement and I would really like to win a copy of this book. It seems we have life wrong – we’re trying to raise our children at the same time we’re in some of our peak earning years. Agree 100% Karen. This is why my wife cut back her work hours immediately after having our daughter and I timed my retirement to have the year with her before she started school. We can always find a way to make more money (even if not as easily after exiting our careers), but can never have this time back. That’s why I appreciate Tanja’s approach of making your finances fit your life, rather than adapting your life to fit a traditional definition of retirement. I am not familiar with her writings, but am intrigued following your review. I hope I win a copy! Glad you pointed out the book’s shortcoming in covering investment vehicle options. There are already plenty of excellent books on that topic. Thanks for the feedback on the book. It sounds like she gives us a way to look at and manage the golden handcuffs that ties most of us down! Hope to win a copy! This looks like a well rounded read and something that would be very beneficial. The topics you mentioned in your post are exactly what my spouse and I are talking about right now. We want the freedom to define retirement for ourselves AND it would be nice to have a reference to guide our conversations. Thanks for sharing! I, too, first read Ms. Hester’s writings on MarketWatch! Regrettably I have not been to Lake Tahoe. I’d still love to have a copy of the book, though! Thank you. Excellent summary of the book. I hope to read it soon as I transition to my semi-retired stage of life, albeit at the old age of 50. I concur that posting minute details about contribution amounts is useless, given that they change almost yearly. It would be better to educate the reader about where they can find the current information. One theme that Tanja writes about and I concur with completely is that every day you can claw back is a win, considering that most people can never retire securely. For all the good that comes from the FIRE movement, this obsession that sooner is better is not good. Comparison can be a theft of joy. 50 is pretty darn good! Why are all young retirees referred to as “ripe” age? That term grosses me out! Just received notice that my copy has shipped from Amazon. Ha. I have a bad habit of using too many cliches in my writing. Thanks for calling me out! I’m interested because I am not a FIRE candidate but am interested in how the author’s views and recommendations could help my retirement planning. Falling asleep on the couch from exhaustion after a killer week resonates well – not what I had in mind when I started my career to make a difference. I’m game for something that contributes to society without killing myself. I appreciate your review of Work Optional. I am nowhere close to their income levels but I do take the authors point regarding the fallacy of labeling anyones definition of financial independence. I would be very interested in reading the book in its entirety if I am one of the chosen to receive a copy. Thanks for this post Chris. My husband and I are preparing for (full) retirement and can technically retire right now (we are in our mid-50s. Interestingly, I really retired 18 years ago from my career when my third child was born. At that time, I was busy raising children and volunteering in scouting and other non-profits, which was enjoyable and helped me build other skills. After the last child went off to college though, I found it difficult to find my purpose. I didn’t want to continue volunteering as much (trust me, this gets tiring after so many years of doing it with a good heart). Three years ago, I went back for a specialized credential in my previous health care field and am loving working very part-time even though I do not technically have to. Since I already experienced 18 years of “work optional” (for my own career), I learned that life is really about serving others whether it’s paid or not. I make little annual income from the work I do now, but I know I am really helping others and that is rewarding. So, in coaching my husband about his own retirement, I tell him that if he is enjoying his work, continue until the mandatory retirement age (yes, there is one at 60). But, if you don’t enjoy your work, quit because you can :). And then find another purpose in life that feeds you and others because retirement without that purpose can be lonely and boring – even if you have the money to travel and do whatever you want. Work, while stressful for many, provides us with human connection and purpose. Too few people in the FIRE community focus on that – they seem so set on retiring “early” just to find out that when they can and do, life is not always as they thought it should be. Having a plan in your retirement, whether early or not is critical for happiness, because money really doesn’t buy happiness! Well, a certain amount does, but there is the law of diminishing returns after a certain level of income. Great comment and a theme I try to emphasize frequently. Excellent commentary. I have been planning to retire early from the time I started working. Sadly I have never been passionate about what I do, those that are…what a true gift. I am single and my biggest concern about retirement is…what will I really do. I hope to join the Y lose weight and get in better shape but how realistic is that they never work out now. Do you plan to volunteer again I don’t like my time schedule for me I want you what I want when I want. So it should be interesting. Thanks for reviewing this book. I too have read finance books that tend to go a little too deep into the details and my eyes start to glass over. I thank you for reviewing this book and would like to have a shot at a free copy. Please consider me for one of the books. Thanks for the review. It is good to see a woman author on this topic. I would like to read more! Tanja was one of the first female FIRE bloggers out there, but her work has certainly inspired others. Agree that we need more females, minorities, etc as it tends to be more inspiring to learn the stories of people you relate to. Even more important, we need a diversity of opinions. Tanja provides both and I give her kudos for doing so. Oh, and sure, I’d love a copy of Tanja’s new book, but that’s not why I commented :). Hi Chris, I appreciate the new (to me) resource and book review. Thank you for the opportunity and I would like a copy. I’m on my path towards early retirement. This sounds like a useful book. I’m interested. I read your blog regularly and have some questions concerning my daughter? (I am retired at 66). We raised her to be responsible with her money, never be in debt to credit cards etc. BUT she became an attorney and now has 200K worth of student loan debt. We paid for undergrad. She is 29 and living the life outlined in the opening of the article and to top it off she lives in San Francisco. What advice can you offer? She seems destined to such hardship. PS I don’t need the book. Thank you. I’ll enter you for the book as it may be exactly what your daughter needs, assuming she is open to reading it. Everyone has unique challenges. Her student debt and extremely high COL area are certainly two. However, sometimes simply seeing and understanding that you have options can become extremely powerful. I’ve met many people who have made remarkable turn arounds in short periods of time. “Our Next Life” blog is everything I despise about most of the FIRE blogs – the flamboyant writing style (Is that what you praise as “writing chops”? Ugh. ), the endless travelogues, the comment streams that are little more than other bloggers patting each other on the back, and the side hustle of speaking at FIRE blogger conferences, recording FIRE blogger podcasts, and conferring FIRE blogger awards upon each other. If you strip all that away, “Our Next Life’s” actual actionable content seems quite low. I agree with Larry. The popularity of such writing escapes me, but I am not of that generation, nor am I their target audience. I am actually retired, according to the dictionary. It will be interesting to see how this all turns out for these folks. I wish them well. I’m a late starter after a divorce and hope to just be able to retire someday. I think I could learn a lot from this book and would love to win one. It’s never too late to start! Good luck. Thanks for scanning the environmental for materials that supplement your periodic information. Thinking I’ll skip the detail financial investing, I do get lost easily on that kind of information. Perhaps you or another writer like Hester, should come up with a Investment for Retirement for Dummies digest. Gracias! Skiing Tahoe is definitely on the list, but hard to justify the $ and effort to take a ski trip this year b/c amazing conditions here at home and we’re still learning our new home mountain. Just ran up this am to ski another 9″ of powder that fell between yesterday close and today’s open. Amazing, but pretty hard to actually do anything productive! First off, I ALWAYS enjoy my visits to “Can I Retire Yet?”. It is one of those blogs where I seek out my fav chair before settling in to read because I so often find reference links that take me to other well reasoned personal finance site! This one is no exception. I have not been hereto exposed to Hester’s blogs, but I plan on going there once finishing this comment. Many FIRE blogs discuss the former, but I’ve seen almost no articles about the later. Specifically, for those of us who do something considered valuable by society, such as medicine, teaching, or research, one feels a sense of guilt and even selfishness contemplating leaving a profession which could benefit others and which took considerable resources, personal and societal, to enter. If you scroll down the index ( https://www.caniretireyet.com/subject-index/) to “Retirement Lifestyles” you’ll find a number of articles that both Darrow and I have written about these topics. Tanja also dives into them regularly over at ONL as well as in the book. I’m 42 and just started to follow this. At this point interested in retiring at 50. I have started reading articles and books, so definitely interested in work optional. Nice job on the review Chris of Tanja’s book. I’m reading your review while currently out on a month long recon mission assessing if Florida is feasible for semi-retirement relocation. I am 45 and my wife is 46. If all goes well, I will continue teaching scuba diving fulltime instead of part-time for the 2019 season and beyond. I enjoy reading FI related materials (especially if they are free, hint hint). I have learned a lot from your site and appreciate the work that you do to support the FIRE community. Keep up the great work! Does the book address health care options? That is one of my biggest concerns of walking away from my employer. I’ve been following a few blogs and podcasts on this topic for roughly the last year, struggling less with the math than what my next phase (i.e. early retirement) will look like. Given it’s release, Work Optional has been spoken about quite a lot lately and I would love to win a copy. If not, I’ll join the names on the ever-growing list at my local library! I appreciated your balanced opinion of the book! I’m 51 and 3 years away from “planned” retirement so looking forward to the planning exercises. This sounds like a great addition to my home reference library! First time commenter. I am interested in FI and working towards it now. Wish I had started earlier in my career, but better late than never. Ms Hester’s story resonates with me because I am neither an engineer nor am I frugal. Hope I get chosen to get a copy of the book. Thanks for comprehensive overview. Definitely would like to give it a read. FIRE, Work Optional, and other euphemisms all sound great. Live the life without ‘the man’. Do what you want, do the things that make you happy. But I am sure, positive, that Ms. Hester has made, and still makes, money. Probably a lot. And definitely more than she spends. I don’t know if she likes skiing, flying a plane, traveling to Europe a lot, eating out, raising kids, all the things that require money. Lots of it. You cannot have a work optional life unless you don’t worry about health and accidents and crises. You cannot raise a large family, or any, without either money, or a commune ife where you can depend on others to support you when necessary. It is true though that if you can live off the land, like a cow, goat, moose, rabbit or eagle, then you need no money. The key to work is to first decide what you want to do in your 75 or more years of life and how much money that will take. How you will live, where, and the cost of things you may or may not be able to do without. Like electricity, water, food, doctor visits. If you blog throw in a PC, an ISP, maybe MSFT Office. All high earning careers are high stress except for football, basketball, baseball and other celebrity type players. Though maybe the worry of injury ending a career or being fired from a high paying job will provide some stress. Actually Mike, Tanja is very open in her writing that she was motivated to seek early retirement b/c she has a chronic hereditary medical condition that left her father disabled, and so she wants to maximize the number of healthy years she has. She also is very transparent that she is not ultra-frugal. I agree that a lot of the early FIRE blogs emphasized frugality and often took health care lightly, but you paint with a broad brush and it is not accurate here. Would love to read the book and see how it applies to my life. Thanks for the great write-up. I’ve been eagerly waiting to read this book and would love a free copy. Thanks for the review. I hope I win a free copy. I’m very curious about the exercises she has for saving. I have enjoyed your web site and your articles.I am interested in Ms.Hesters book and hope to win a copy. It seems that most “early-retirees” aren’t actually retired. For example, they make money writing books or blogs on early-retirement. Then they redefine retirement to somehow include income from labor. Nevertheless, to possibly overcome my skepticism I’d like to win a copy of this book. Do you realize that is sample bias? 100% of early retirees who have a blog or write books gain some benefit from it, financial, social, etc. However, for every blogger/writer, there are hundreds (more likely thousands) of people pursuing this path that don’t write about it. Who do you think is reading the content? Just look at the 100+ first time commenters on this blog post that have never even written a comment before, let alone write to create content and monetize. I enjoyed your article. I am a civil engineer looking to retire from my first career early and begin on the next chapter. I am always interested in reading articles surrounding this topic. Thank you for sharing. Sorry to hear about your wife’s medical issues. Health care is a challenge (probably the biggest for most Americans planning early retirement) and there is no good universal answer, but this is something she definitely addresses in the book and on her blog as well as something we frequently cover here. Prayers and best wishes to you both. I’ve been enjoying both can I retire yet and next life. Both seem practical and down to earth. I’d enjoy reading the book. Thanks. i’m not a beginner so don’t send me the book. Well, a book could be given to my son who probably needs it. Go ahead if I “win.”. I like the review. No book is perfect for everyone but everyone can learn from anyone — usually. My son should really start thinking about retirement. He’s almost 40 and definitely stressed. While I’ve been following you for some time, I admit that I’ve not looked at “our next life.” Will do so after reading about this book. In general, I’d agree that the decision to leave the daily workplace can be stressful. However, as mentioned, it is not always about the numbers but the desire. And yes, open communication with the spouse is quite critical. Iam interested in learning more. I would like retire in 6-8 years and I am not sure I am on track. May this book would help me. I have enjoyed quietly following your blog and would be interested in trying to win a free copy of this book! Tried posting this already but it didn’t seem to go through. Although a lot of FIRE blogs discuss the first category, fewer do the second. In particular, there is the concern by those in professions such as medicine, teaching, or research that retiring early is somehow selfish and “wastes” the resources spent achieving specialized skills. The idea of early retirement being “full early retirement, semi-retirement and[or] career intermissions” is very interesting to me and I would like to read more about it. It appears many of the FIRE downer crowd (Orman comes to mind) miss this concept entirely. Why can’t we transition between these three steps as we would like? Part of life’s journey is not having to have every detail perfectly mapped out. Most of us did extensive retirement planning during our work years, but may have not hit the exact mark when we thought we would. It wasn’t a failure, it’s just how life happens. The same is true of FIRE. We don’t know exactly how every detail will work out, but because we understand ourselves and plan for the unexpected, I expect we will all do just as fine. At 60 I’m too late for early retirement but I’ve been a follower/student of FIRE for close to 2 decades. I’m sure I could benefit from reading to get ready for what happens after I finally pull the trigger in June 2019 (after an 8 month trial run in 2018). I also have a 27 year old who would benefit immensely from reading this book. I would love to get a copy of “Work Optional!” Thank you for your posts. I would love to get this book and learn for it. Sign me up. Thank you for the thoughtful, comprehensive review. I enjoy your blog posts regularly so please keep them coming. I think it is always valuable to gather many perspectives even if they diverge from our own. If we all had the perfect FIRE blueprint, we would have executed years ago. FIRE is an inexact science in my opinion and as such, all knowledge is helpful. I would love a copy of the book if I win. Would love to have a copy! We just started the FI journey and am trying to get my partner on board from big picture to the details. Would love to win a copy of this book! We started our FI journey just a year ago and am trying to get my partner aboard while also learning the big to small picture details with all these moving parts. I’m excited to read Work Optional as I’ve loved Tanja’s writing style on her blog. She always pushes the limits to find what her and others’ FIRE plans may be missing, financially and emotionally, and I appreciate that. Thanks for this review of the book. Thanks for the review, I like the part about going beyond just the dollars and thinking about life. Been reading your blog for quite a while and it was one of the first things that got me looking seriously at retiring and now I’m ready! A copy of the book would be fantastic. Learning a lot from your website, and very much appreciate hearing your take on her new book. I’m sure I’d enjoy reading it as I prepare for my own FI someday, so count me in for the contest. Thanks, and keep up the great work on the blog! Interesting book. Even though I am retired you can always teach a kinda/sorta old dog new tricks. Please enter me in your drawing, guy. Much appreciated. Thanks for this thoughtful review. Looking forward to reading as I enjoy the blog and appreciate Tanja’s efforts to support women in achieving FIRE. As a fellow Californian, I’m also interested in how they made FIRE happen while staying in our high cost of living state. Promise to put my savings from the free book toward savings. Thank you for your review and comments. Always appreciate your insight. Please include me in the raffle. Thanks! Thanks for the review – sounds like some great info to consider. Appreciate your review and would love to have a free copy of the book to give to our son & daughter-in-law. I would like to share this with my wife and friends. It would benefit most if not all of them tremendously. Thanks just the same for your many posts which have benefitted myself. Wish I had all this info from all the early retirement bloggers and the financial blogger community when I started out. I would love a copy of “Work Optional”!! Thank you for the opportunity! Thanks for the thorough review. My husband and I are semi-retired, but I struggle with the “risk”. Love your blog. Great review. I would love a copy to broaden my financial education. Excellent review Chris! I’d love to receive a free copyof the book. Thanks for all that you do! I am not a retire early individual having not yet retired at 61 but I still feel young and any advice about how to make the best of retirement interests me. I’d love to have a copy of the book. Thanks for sharing a good review. I want to read the book and learn how to apply it to my financial life. Hope to retire soon. I look forward to reading this book. So much of your review resonated with me. I tried an 18-month practice-run at retirement two years ago. The time off was amazing, but realized I wanted a slightly higher standard of living than what I had budgeted. I returned to work and am now planning my real retirement to start in a few months. A diverse income stream will definitely allow me to sleep at night, combining a rental property, pension, and investments. Thanks for the great review! Made me want to read it, even the chapter with “too much” detail! My husband and I are within 3 years of retiring at 59 and 62. Wish we could have done it earlier, and we probably could have if we had known all this great information way back then. Thanks for your very informative blog! I’d love a copy of “Work Optional”. I’m interested in LTC and other risk management topics. Thanks! This article got a really unusual flood of comments. Did the offer of Free Stuff really do that, or were newbies being referred to it from other FIRE blogs? As a regular guy, it’s very noticeable that “Our Next Life” consistently brushes off the husband with pithy references such as “the accomplice” or “the partner in crime”. He never seems to write anything. thanks for the review. Would love to get a copy of the book. always looking for the advice/experience of like minded people about early retirement. Work Optional?….that’s crazy…for most of us, retirement is hard work at any age….but it’s FUN work!